I hate when the phone rings when it’s not supposed to. There’s almost never anything good on the other end. And though yes, I begrudgingly participate in the 21st century and own a cell phone on which people can call me when necessary, I’ve trained most of my friends and acquaintances to text or email me when they need me or I’m late for something. So when the phone rings and it’s not an 800 number or that phone number from St. Louis that keeps calling me thinking I’m someone named “Al,” The Fear kicks in, and I’m positive someone is dead. On a recent morning The Fear kicked in when my husband called me only 45 minutes after he’d left for work as a teacher at the University of Hawaii (or Hawai’i, in the native spelling). “What’s wrong?” I asked, skipping the niceties. My guts sank. My husband is a wonderful person. His crazy cat tendencies rival mine, though he is decidedly more optimistic when it comes to lost or feral cats. Whereas I’m ready to administer mouth-to-mouth if a yard cat so much as sneezes, he can suppress his crazy and simply say, “Bless you, kitty,” and move on. So when he called, his voice hesitant, the wind and rain roaring in the background, I knew this could not be good. When I pulled into his building’s parking lot, I found my husband standing in an empty parking spot, shielding a small black pile of fur from the rain with his sweatshirt. As I walked to the spot, I noticed a cluster of feral cats watching the scene from a hill above us. The University of Hawai’i, really the island of Oahu (or O’ahu in the Hawaiian spelling), is overrun with feral cats, and while they are very okay with the humans who inhabit their island, the fact that the little black furball was letting my husband get so close to him without a cup full of kibble was alarming. I got my first look at this little cat. On better days he must have been a longhaired tuxedo cat — mostly black with a white bib and little white paws. However, today the poor guy was soaking wet, revealing his gaunt frame, and he was filthy from tip to tail. He looked like he had tried to curl up, but only his front half would comply. His back legs sprawled partially under his body at odd angles. The little tuxedo cat, whom we immediately dubbed “Grimy,” groggily opened his eyes and ever so slightly lifted his head as we were speaking. His eyes were cloudy yet imploring. There was no doubt the poor fellow was not long for this world. At the same moment, a driver in a red truck pulled up behind us and gestured for us to hurry up so he could get the space. “PARK SOMEWHERE ELSE!” I shouted and gestured to Grimy. Upon seeing the cat, he waved his arms furiously and barked back, “Oh come on! It’s a cat!” before speeding off. I was determined to give Grimy a little more dignity. Pulling off my sweater, I gingerly wrapped him up and carried him to the car. “We need to go to Dr. D,” I said to my husband, and tossed him the car keys so he could drive us to our trusted vet. As you can probably guess, Grimy didn’t make it. He was suffering, so with help of our vet, we decided to clean him, get him rehydrated and warmed up, then euthanize him. I still get choked up thinking about Grimy. And it’s not because Grimy died. Though his life may have been hard, I find some comfort, and I hope he did too, that he died warm, safe and not in pain. What breaks my heart is the fact that Grimy’s life and demise was met with such callousness. To many he was not a cat, he was a number — one of thousands. I love my vet, but I was taken aback when upon bringing him into the office, the vet techs turned a bit cold when it was revealed he wasn’t our cat but instead a feral. I admit that I am a bleeding heart, and probably more than a little naive when it come to these things, but why should the value of a life be in any way diminished simply because of who he “belongs” to? But like I said, the island of O’ahu is overrun with cats, and many of the residents are simply exhausted by this problem. 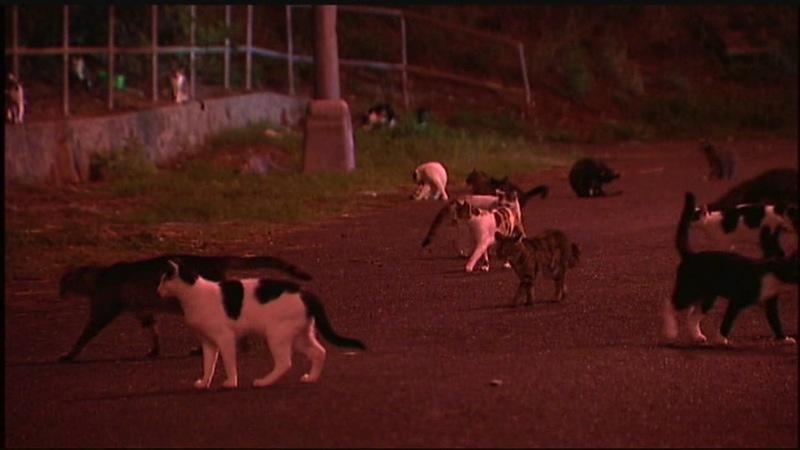 It’s not unusual to see a parking lot or park thick with dozens of cats at night. 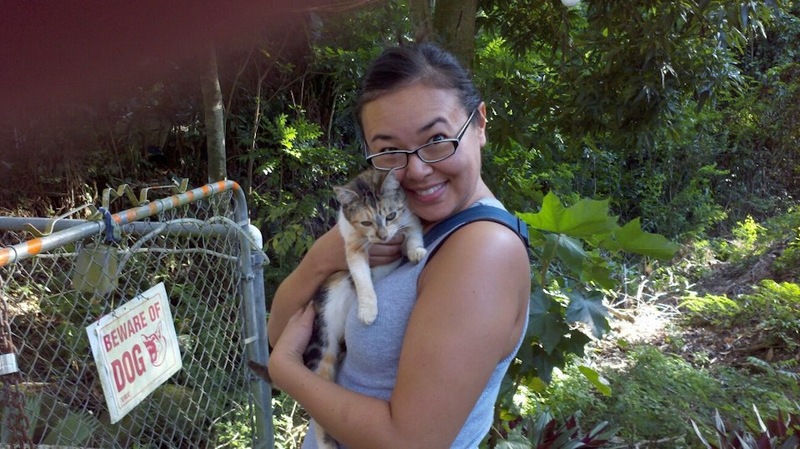 The Hawaiian Humane Society and Hawai’i CatFriends have teamed up to actively try and manage the feral and abandoned cat population (numbering approximately 300,000 as of November 2013) through a Trap, Neuter, Return, and Manage program. But until the island’s community really supports this effort, the population continues to flourish. I fear most people, frankly, can’t be bothered. 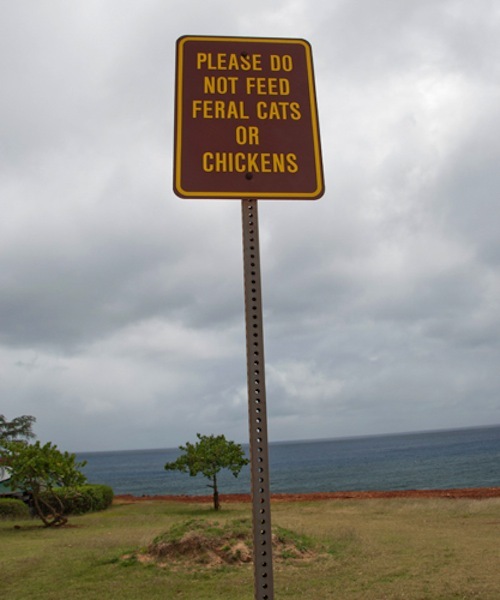 In an interview with the local affiliate KITV, Steve Geimer, a feral cat feeder working with the Hawaiian Humane Society, cites abandonment as another major cause of the ferals. “We had one person who was going to abandon four kittens and two pregnant cats. We were able to stop that, but we’re not down there all the time,” he said, commenting about a feral cat colony in the community of Hawai’i Kai. CatFriends and the Hawaiian Humane Society held a conference recently to try to figure out what to do about the feral cat problem, and both groups continue to work the TNRM program (CatFriends sterilizes “over 3,100 cats a year,” stated President Jennifer Kishimori in the same KITV piece), but the problem is overwhelming without the commitment of the O’ahu community. Which, sadly to say, is sorely lacking, based on my short time here. Feral cat colony caregivers are often met with aggression. A woman I know who feeds a colony outside of Honolulu now has to make sure one of her rotating roster of “bodyguards” is with her when she feeds and administers to the colony at night. Threats of violence have been made against her. At what state is our humanity when charity toward a creature in need — indeed a charity that benefits the entire community, as my friend also participates in the TNRM program — inspires violence? I don’t pretend to be an expert or even begin to be able solve this problem. When people see me scampering around the neighborhood or UH’s campus trying to coerce a cat into letting me help him or her, I’m often asked, “Why? It won’t make a difference, it’s just one cat out of so many.” And maybe they’re right, but doesn’t it start with one cat? And then the next? This may be an overly simplistic way of stating it, but it’s people thinking it won’t make a difference that is exacerbating the problem. Look, I’m far from perfect, there is so much more that I could do. But what I’ve learned about myself through Grimy and Tailsy, is that the day that I turn my back on that “one cat” will be the day that I will call into question the state of my own humanity. If you would like to know how you can help with O’ahu’s feral cat problem, visit Hawai’i CatFriends for more information on volunteering, participating in the TNRM program, or donating. Other organizations that are working with the feral cat population are The Hawai’i Cat Foundation and the Hawaiian Humane Society. 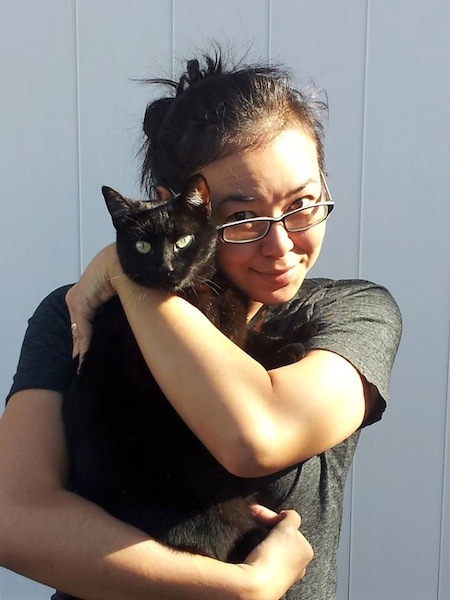 I Talk About My Cats Like They’re My Babies — So What?